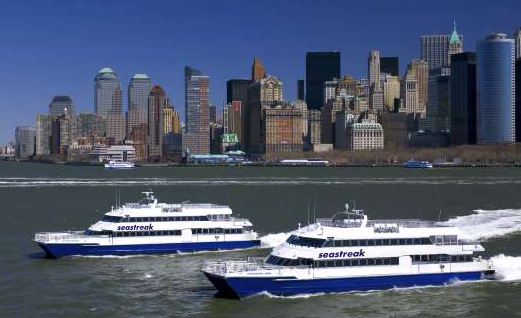 Seastreak has launched a new fare valid through Memorial Day in which it will offer round-trip ferry service between New Jersey and New York City at no cost to children age 12 and younger who travel with an adult paying the full fare rate. Through this promotion, Seastreak is hoping to encourage families to explore New York during the winter months. During these trips, Seastreak’s ferry service from Highlands and Atlantic Highlands, New Jersey will be docking at Pier 11 and at East 35th Street in New York City, which will provide access to attractions such as Grand Central Station’s Train Show or Radio City Music Hall during the holidays. Seastreak has 13 departure times from New Jersey to New York on weekdays and five departure times on weekends. A complete schedule is available online at http://seastreak.com/nynjschedules.aspx. The trip from New Jersey to New York aboard a Seastreak ferry takes less than an hour and is an alternative to the congestion of traveling into the city using a car or public transportation. Tickets, including the no-cost fares for children 12 and under, are available by calling 1-800-BOATRIDE (1-800-262-8743) or by visiting http://www.seastreak.com. Next How Are You Surviving Sandy?